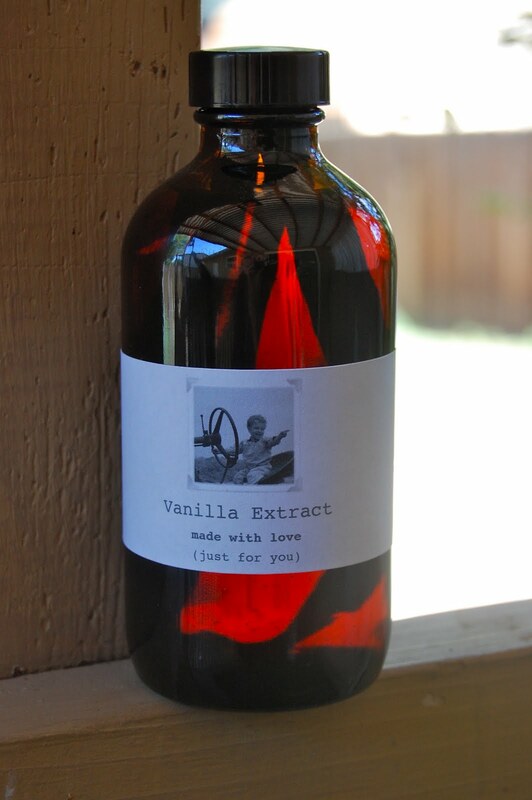 I'm really excited to share one of my latest projects with you: Homemade Vanilla Extract. Vanilla Extract is compose of two ingredients: Vodka and Grade B Vanilla Beans. One of the many things I love about this project is that it's inexpensive. Also, if you like to bake as much as I do, you know Vanilla Extract is an essential in your pantry. To this day, one of the gifts I remember most from my parents is a bottle of Vanilla Extract from Mexico. 1. Prepare three vanilla beans for each 8 oz jar you'll be using. In order for the beans to fit into the jars I chose, I had to cut an inch or so off of the ends (I put them aside for use in my grandfather's homemade Kahlua). Then, I took my kitchen shears and split them up the middle, leaving the tops connected, rather than splitting them all the way. 2. Put the beans in the jar. Using a funnel, fill the jar with vodka. 3. Place the cap back on and set aside in a cool place and give it a good shake once a week. Do this for two months, when it will be ready for use. Top off with more vodka as needed - those little beans will keep on doin' work for you. I wanted to be able to use whatever I bought for labels in a creative way, so instead of messing with a predetermined size, I bought the full sheet shipping labels. This way, I could cut them into ovals, or hearts, or stars (or rectangles, which I ended up doing anyway). But I can also use them in different ways for different projects. I'm good with that. I used the business card template in my word processing software (Pages for Mac), which gave me the approximate size label I was looking for. I imported a picture of my son, chose the font I liked (Courier), rearranged a few things, and came up with the label you see. You still have time to make these as Christmas gifts. Enjoy! Thanks for it. Online casino games have developed world-class. Online casino games have raised the gamut of access to all ages, with the technology can play through on both mobile IOS and android, Golden slot so it is more convenient without having to go to play at the casino as before. The online gambler can play anywhere with realistic sound as if you were playing in the real casino. The online casino game is the top of the leading gambling. The fun of betting on a lot of fun in the area of ​​luck, fun in the game that you want to play, choose your favorite game to play with the day. New Hope, Newest Game, Newest Challenge, Thrill, Bet, and many other bonuses.